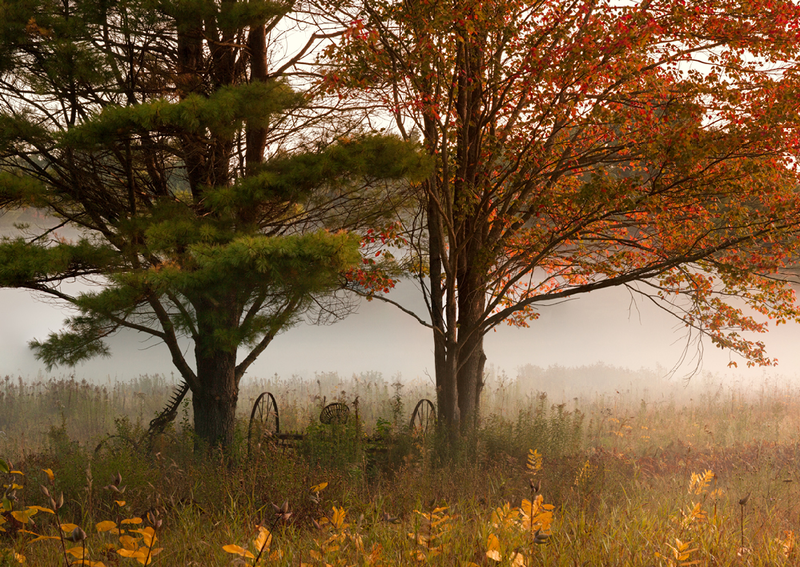 Location: Arundel, Maine • Date: 9/24/09 • Standard Print (w & h): Image: 42.3" x 30.0"
This image of two trees, an old hay rake and sickle bar on Sinnott Road is composed of 9 individual shots taken at 180mm. I took these shots about a mile from a house where I used to live. I ran, biked and drove by these two trees many times, but finally stopped on this morning with the mist settled low in the pasture. By the next morning the pasture had been mowed, more leaves had dropped and the scene had disappeared.